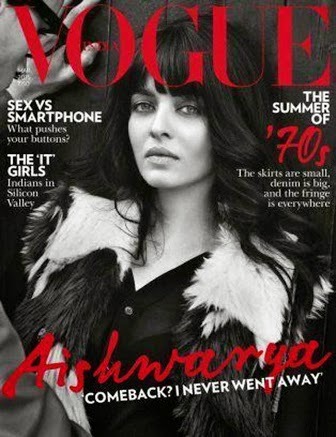 New Delhi : Bollywood megastar Amitabh Bachchan's daughter-in-law, Abhishek Bachchan's wife and an actress also Aishwarya Rai Bachchan is looking very glamorous and sizzling in the cover photo of Vogue India Magazine March 2015 issue. While all the fans and supporters of Indian silver screen are holding up for Aishwarya Rai Bachchan to make a rebound to the silver screen with Sanjay Gupta‘s ‘Jazbaa‘, the previous Miss World is as of now over to enchant the crowd and readers. Aishwarya Rai Bachchan gimmicks on the spread of the March issue of Vogue India and looks all of the diva that she already is. The spread additionally has a fascinating and eccentric quote by her that says, “Comeback? I never went away.” And we concur. Brandishing edges and Tommy Hilfiger attire, Aishwarya Rai Bachchan positively makes each different performing artist run for her money in her new look.